Oh, my stars; the Grace Brothers Brewery steam whistle has turned up. According to a Press Democrat article, a man who identified himself only as “Gary” dropped it off at the Sonoma County Museum along with a note that he had swiped it in 1966, when he and other kids were up to no good and sneaking into abandoned buildings (and a big thanks for doing that and rescuing this artifact as a result). For generations, as Gaye LeBaron notes, it kept Santa Rosa on schedule, blowing to announce lunch time and quitting time. But in the years around the 1906 Santa Rosa Earthquake, the whistle had more important jobs as well. Santa Rosa’s water system was a mess until it was upgraded in 1907, causing the town to enforce severe conservation measures. Policemen, firemen and city inspectors became water cops, empowered to wake you in the middle of the night if water was heard running. You could be fined $2.50 for a dripping faucet and you were billed a monthly fee for every tub, toilet, and sink in your home. Lawns and gardens could be watered only at certain times and/or certain days depending whether you lived east or west of Mendocino Avenue; in the scheme used following the earthquake, the east side could use a garden hose between 4 and 8 o’clock, while westerners had the hours between 5 and 9. Starting and stopping times were announced by the steam whistle. 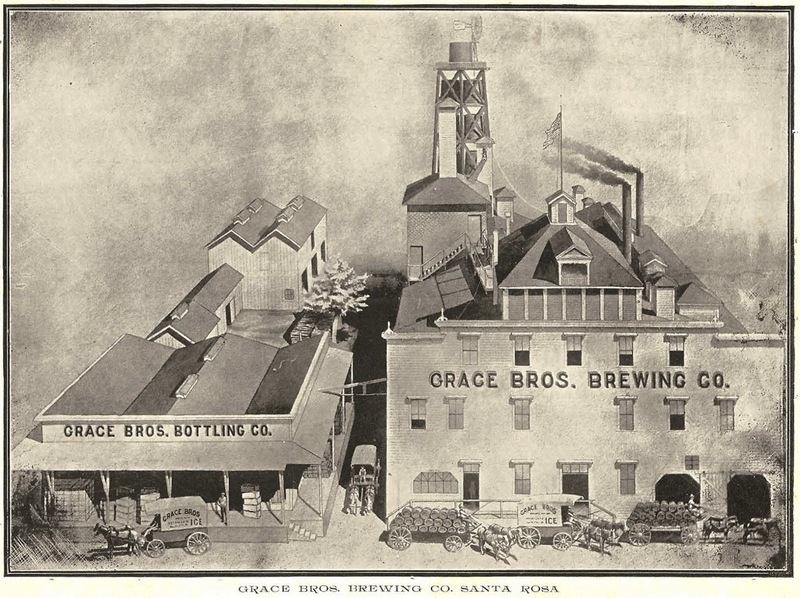 The Grace Brothers’ whistle also became Santa Rosa’s fire alarm for a few years after the earthquake, tooting out a code that alerted our volunteer firemen to drop whatever they were doing, jump on their bicycles, and pedal like mad to a specific neighborhood. (The alarm system and codes are described in an earlier article.) Anyone using water at that time was required to turn it off immediately to ensure the firefighters had adequate pressure. If you’re keeping track, all that meant the brewery whistle was sounding at 12, 4, 5, 8, and 9, plus any time it was needed by the fire department. When that thing started to blast off, I imagine people often just stood still for a moment with their heads cocked, like puzzled dogs, trying to figure out if they were supposed to eat, start, stop, turn off or go home. There was also another steam whistle over at the power company used to summon the on-call lineman. In that era, light bulbs were somewhat of a luxury item in many homes, handmade and expensive; instead of buying them, it was more as if you leased them from the power company, or subscribed to its light bulb service. If a bulb burned out – even in the middle of the night – customers expected the company to replace it pronto. Ask nicely and their certified light bulb technician might even screw it in for you. THE 1906 EARTHQUAKE GRAVESTONE: WHO LIES BENEATH?